-Enjoyed our brief stay. A warm and helpuf greeting by Constance and a very nice chat with Madame at breakfast. -Your château and beautiful surrounding are a lovely memory. Merci et au revoir. -Thank you for our visit at your beautiful and historic château ! We enjoyed the peaceful surroundings and your gracious hospitality. We also enjoyed your sons. We would be welcome you all , in our home or in New York. -Thank you for allowing us into your home to experience history. The region, the château and the hosts are fantastic. We will be sure to pass the word on to all of our friends. -We have spent 3 peaceful days enjoying the company, the cows, Feline and Lodgia and the tranquil setting of this ancient château. Next time I will write in French as well as speak in French (and next time I will know all my prepositions and adverbs) We are serious when we say we would welcome you or your children at our home. A bientot j’espère. -Sat here at his old writing desk with beautiful view over the french countryside, one should he inspired to write something memorable. The setting and hospitality are special, a rare treasure. 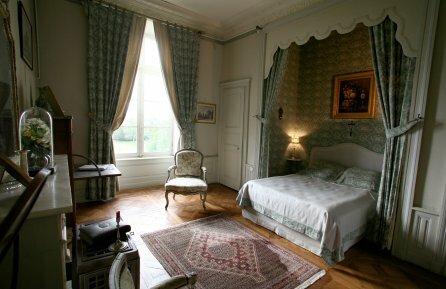 -Located on the first floor, the Louis XVI room opens south with a view on the Sauldre valley and the garden. -First night: 120 Euros per night. -Second night and more: 105 Euros per night. 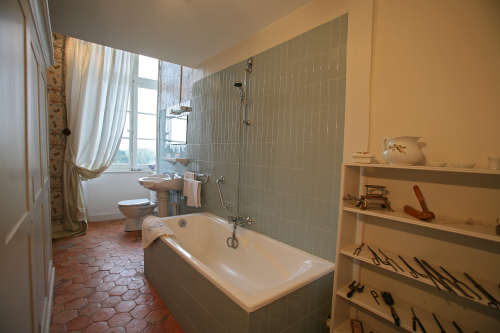 Bathroom and toilet en suite..
-Stay from 1 to 3 nights: 15 Euros for the whole stay. The comfortable facilities are traditional and the breakfast is served in the banquet hall and included in the price of your room. This one is covered with Wifi, so that you can work from it. The host receive you for diner in the dining room. The diner includes an aperitif, a starter, a main course, cheese, desert and wine. Price : 45€ per person. To make your arrival enjoyable and avoid you to drive again, we propose a cold diner to enjoy between yourself. It includes a starter, a main course, a desert and 1/2 bottle of Sancerre wine. Price : 28€ per person.